It is time for Dave Johnson's newest project, the YCCS to get going full swing. This development in the British Virgin Islands is certainly not the cheapest spot for a 2nd, 3rd, or 4th home, but it sure looks to be beautifully situated. 1. Started from scratch. Bay Harbor used to be a desolate gravel quarry. not exactly picturesque. The idea of turning this into an amazing resort community was so far off, nobody would listen to Mr. Johnson's vision -- particularly investors! But, he pulled the money together and did it. I believe he stayed debt free throughout. 2.Residents. All Bay Harbor residents we know are extremely friendly, down to earth people. We can be washing a boat, and the owner will come outside to talk boats, and then invite us in to have a beer and see his home theater, or antique car collection. It is easy to respect people who respect you, and we are always excited to pick up a new customer, not just because it is a new boat, but because it is a new 'story', someone else to get to know. 4.Staff. The only people friendlier than the residents are the staff! FMYC has been helped so much by the friendly staff at Bay Harbor. Sometimes, at a public marina, or poorly run docks it can be hard to get things done. You'll hear things like "Oh I don't know if you can do that" and "I'll have to ask my manager" when trying to do the simplest things. Not so at Bay Harbor. If something needs to get done, it getting done! The staff is capable and empowered. We would like to thank John Russell, the BHLM Harbormaster in particular, for making BHLM a dream to work at, help us at Bay Harbor events, and often being a liason to new customers. This mentality is shown in a favorite story of Lewis and myself, of Mr. Johnson driving around in a GEM car during some event, a I believe a '08 boat show. He was pulled up at where the Oil Nut Bay (same site as YCCS) promotional center was, and one of his employees was explaining to him some problem, of a customer/resident/investor who wanted something done, and wasn't sure of how to proceed. Mr. Johnson's reply was 'Do it! '; "just say yes! just say YES". With a man like Mr. Johnson with the reigns, you know the development will exceed all expectations. In any case, try as we may, we will NOT be covering the Superyacht regatta live. 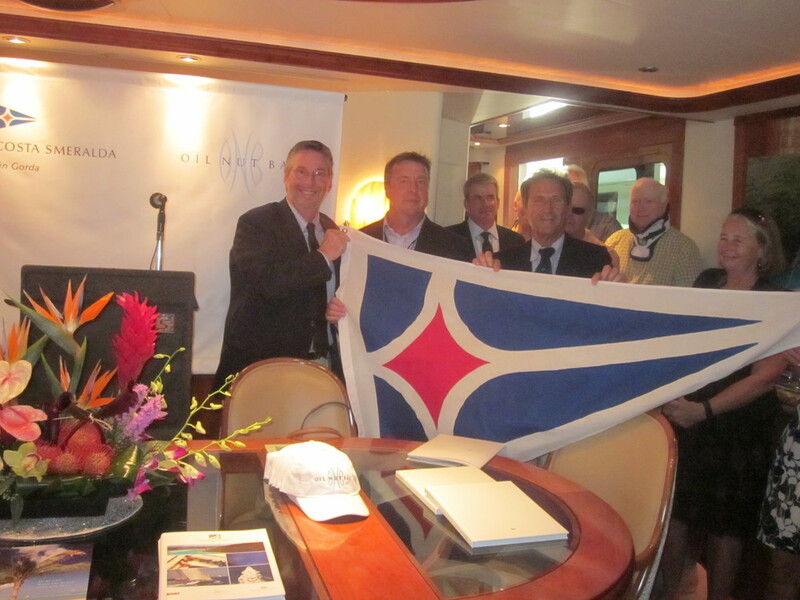 But you can see some of our pictures of the announcement ceremony on Mr. Johnson's 130 Westport RESOLUTE that we were in attendance for. We have a video of his speech (quite funny, I recommend you watch all the way through!) we will post. Looking at the Superyacht Regatta schedule, don't you want to go? Registration will take place at Yacht Club Costa Smeralda (YCCS), Virgin Gorda as well as customs clearance for yachts and crews from 9 a.m. to 4 p.m. Practice for sailing yachts will be held from 9 a.m. to 4 p.m.
Trip to The Baths, snorkeling adventures or scuba diving. Private or group guides available will be for each adventure from 10:00 a.m. to 4:00 p.m.
Skippers’ Briefing: Sailing yacht captains – 4:00 p.m.
Skippers’ Briefing: Motor yacht captains – 4:30 p.m.
Sundowners and welcome cocktail reception will be held on YCCS lawn from 5:30 to 6: 00 p.m.
Caribbean buffet, reggae band and local entertainment on YCCS lawn 6:00 to 9:00 p.m. Sailing Yachts: Race Day 1 11:00 a.m.
Motor yacht Program: Cruise in Company following the yacht racing, followed by lunch and swimming at quiet anchorage VIP Host yacht Resolute to lead the fleet 11:00 a.m. to 3 p.m. Sailing Yachts: Race Day 2 11:00 a.m.
Motor yacht Program: Tender Treasure Hunt. Cocktail and Canapé Competitions; each yacht will create a cocktail with a prize for best Caribbean-themed cocktails and canapés from 6:00 to 9:00 p.m. Sailing Yachts: Race Day 3 11:00 a.m. to 3:00 p.m.
Motor yacht Program: Cruise in company to Jos Van Dyke or Peter Island. Cruise to take in the finish line at the end of the race from 11:00 a.m. to 1:30 p.m.
Sundowners and Prize-giving on YCCS lawn – 4:00 p.m.